The Chengtou Han tomb complex is located in the Chengtou Village, Sixi Town, Shanggao County, Jiangxi Province. It is about 100 m north to Jin River and about 10 km south to the No.320 National Road. 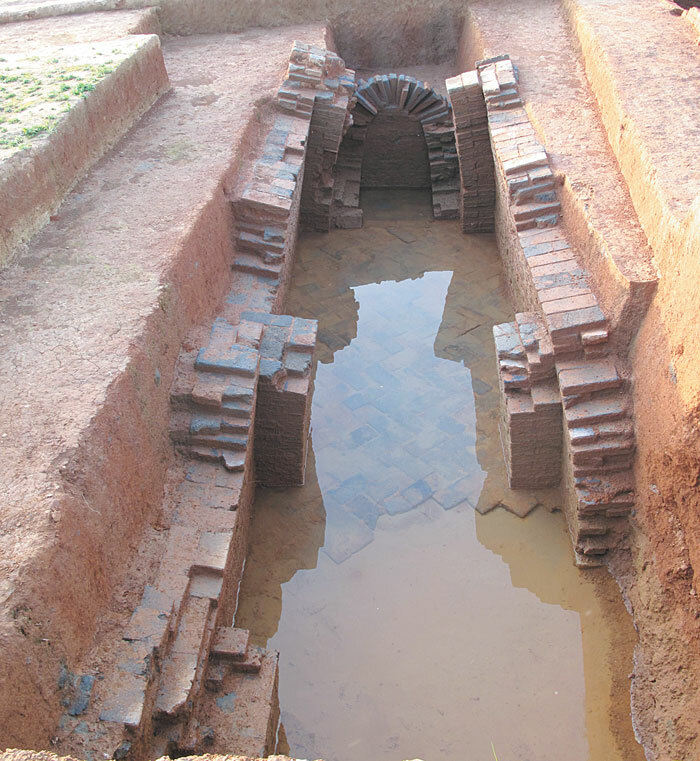 On 12th of March, 2012, Jiangxi Provincial Institute of Archaeology, Yichun city Museum and Shanggao county Museum jointly carried out a salvage excavation on this tomb complex. They excavated the exposed ancient tomb-M1 by laying out 10m×15m squares unit and test excavated the possible tomb area by applying a 2m×40m trench. In the trench, there were five tombs (M2-M6) found. In addition, they excavated M7, which was found after investigating the surrounding area, by applying 3m×8m squares unit. Up to 26th of April, there were seven tombs excavated in all and rich grave goods were unearthed. There were seven tombs excavated. All of them faced to south with brick chambers and arched ceilings. According to their structure, the tombs could be classified into cross-shaped and rectangular shaped. M1 was a cross-shaped tomb and consisted of a grave gate, a front chamber, a left and a right side chambers, a rear chamber and a passage chamber. It was totally 11.26m long and 7.12m wide. The arched ceiling in the rear chamber was well-preserved and was 2.52m high. M2-7 were rectangular in shape but they were slightly different in structure. M2 consisted of five parts: a front chamber, a middle chamber, a rear chamber, a grave gate and a passage chamber. It was totally 11.71m long, 9.19m wide and about 1.82m high. There was no passage chamber but a niche in the rear chamber of M3, which consisted of a grave gate, a front chamber, a rear chamber and a niche. M3 was 7.35m in total length, 2.72m in total width and 1.52m in remained height. M4-7 were similar in structure and each of them consisted of a grave gate, a front chamber, a rear chamber and a passage chamber. They were 7.8m-9.67m in total length, 2.22m-2.6m in total width and about 0.7m-1.68m in remained height. Passage chamber had an arched ceiling and was connected with the rear wall of the rear chamber of the tombs. The passage chamber had two positions in the tombs. The passage chamber of M1 was located in the left side of the rear chamber, and the others were located in the middle of the rear wall of the rear chamber. The tomb walls were built with transversely and longitudinally overlapped bricks. Between the brick poles and the tomb walls, was longitudinally paved with bricks which were transversely and longitudinally jointed and similar with the mortise and tenon structure in the wooden architecture. The ceilings of the tombs were built by longitudinally overlapped axe-shaped bricks, which were thin in front and thick in end, in order to make the arched shape. The floors of the tombs were paved with lambdoidal bricks. The tomb bricks had two types: flat and axe-shaped. The surfaces of the bricks were mostly decorated with leave veins pattern in order to increase friction coefficient. The patterns were generally imprinted on the profile and were mainly cross-shaped pattern, cross-shaped with coin inside pattern, net pattern, chords pattern, symmetric half concentric circles up and down, wheels pattern, leave veins pattern, etc. In addition, inscriptions “宜子孙”(wish children and grandchildren have a good life) were found in the profiles of a few grave bricks. Due to multi-factors, the grave goods numbers from different tombs were different. In total, complete artifacts and recoverable artifacts were 153 sets or 171 pieces. The grave goods included potteries, celadon porcelains, brown porcelain, golden and silver artifacts, iron artifacts, coins and talc artifacts, etc. Potteries included stamped ornamentation potteries, green glaze potteries, black coating potteries and brown-graze potteries, etc. Stamped ornamentation potteries included jars, bo 钵bowls, lids (tenon-shaped rim, biscuit-shaped, umbrella-shaped), an案tables, granaries, spinning wheels, pottery plaques, stoves (including pots, cauldrons, streamers), wells (including buckets), etc. Green-glaze potteries included plates, tri-foot plates, ear-shaped cups, lids of granaries, wells, stoves (including pots, cauldrons, streamers), etc. Black coating potteries included jars, plates, bottles with double buttons, ear-shaped cups and lamps with high stem etc. Brown-glaze potteries included jars with double buttons. Golden artifacts were small golden ornaments including rings, hollow tigers with holes on the bodies, beads. Silver artifacts included silver hairpins. Iron artifacts included iron swords, strip-shaped knives, ring-headed knives, concave knives, knives, sickles, and so on. Coins were “五铢” Wuzhu coins. Talc artifacts were carved pigs. 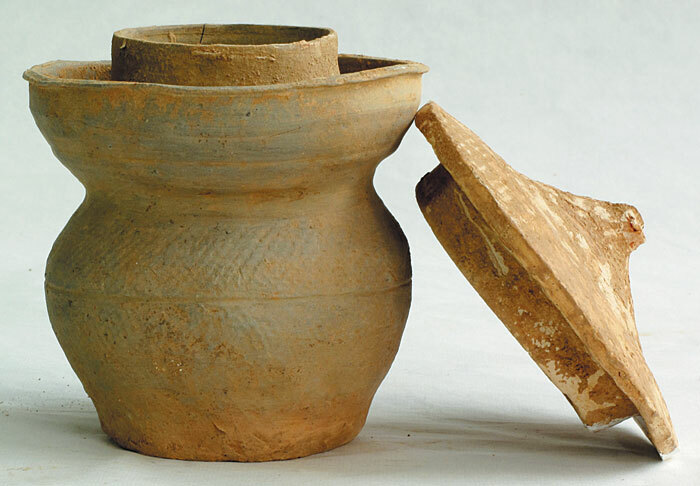 The grave goods unearthed from this excavation were mostly funeral ware, not only including typical wells, granaries and stoves, etc., but also jars with double rims, which were also called preserved vegetable jars and were the most-typical artifacts with the largest number. Because of their small size, jars and lids did not closely meet each other and the scales of the jar bodies were imbalance. So they may have been the grave goods specially made for the dead.